On October 26, 2009, it is the 100th anniversary of Ahn Jung-geun’s assassination of Hirobumi Ito, who led Japan’s annexation of Korea. In the memory of Ahn’s patriotism a century ago, people’s attention to his works and the history is raised. Korean government recently received Ahn Jung-geun statue back from Harbin , northeastern and temporarily set it up in front of the National Assembly Building . Hearing the news that the statue of Ahn Jung-geun, who is the symbol of Korean spirit and pride, has no where to belong yet, the Bucheon city decided to put the statue of Ahn in Bucheon Joongang park to mark the 100th anniversary of Ahn’s assassination. Lee Soo-gwang, an author, writes a book about Ahn Jung-geun as he followed Ahn’s way from Korea to Harbin. The book has just released in June, 2009 and keeps grabbing readers’ attentions as their interests on Ahn Jung-geun raises. The book, Immortal Memory of Ahn Jung-geun, develops the story by the author’s travel journal from Sokcho, Korea to Russia and China, and a factional story in the form of Ahn’s memoir. The author provides stories based on his travel journal; Lee traces where Ahn was for 10 days and nine nights and depicts about the places Ahn stayed and had independence movement. Lee also develops the story based on fact and fiction; the factional part of the book includes the recollection of Ahn’s memories from the days he lived until the day of his execution after the assassination. The factional part of the book is in the form of monologue which Ahn talks to himself while thinking back to his memory from his childhood to the present. 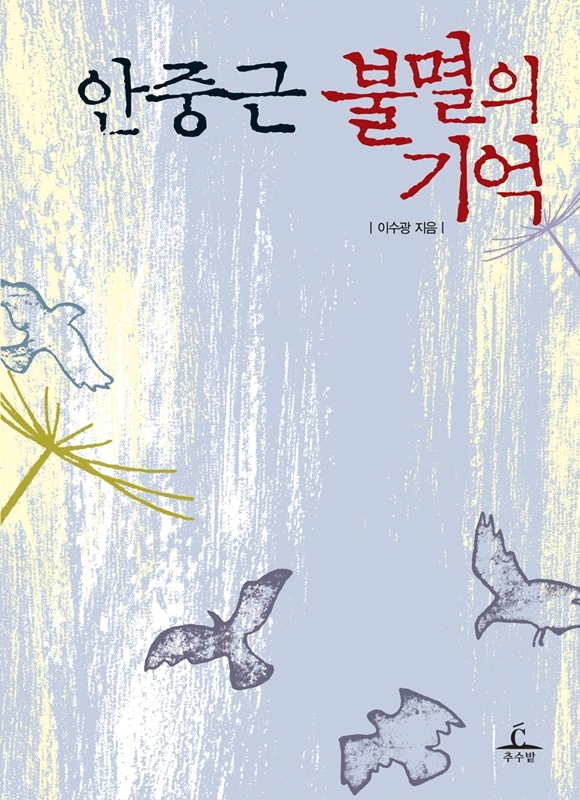 It has been reconstructed based on Ahn’s autobiography, The History of Ahn Eung-chil, which Ahn wrote before his trial to deliver the feelings and the tension he had in the book. It is usual to have larger number of people’s attentions when a specific subject of person corresponds to what kind of person the society wants in the specific periods of time. Today, people who already have much possession yet desire to possess more and think about self-interest. Some say they would like to share what they have but do not practice the sharing with their neighbors. However, Ahn Jung-geun lived for the national interest of Korea, not for his own good or his own interest. Ahn wished for peace and left for independence movement with his accompanies and practiced his fate, leaving his family and his town behind. According to Ahn Jung-geun Memorial Foundation, Ahn should be considered as a man whom younger generation needs to study and learn about his sublime spirit to accomplish independence and also whom we can follow his practice for construction of democratic society and peaceful independence. Lee Soo-kwang, the author of the book, Immortal Memory of Ahn Jung-geun, mentions that the book is based on 90 percent fact and the rest, including lines, words, and emotional expression, are created by him. “The book, overall, is structured upon Ahn’s autobiography. However, when I wrote up, I sometimes had to conjecture about his life because not every fact is recorded in Ahn’s autobiography due to several reasons; He was in uncomfortable environment because there were many people keeping eyes on him about what he did or who he met,” said Lee. He added, “At first, I was writing a book about rich men in Asia in the history. While research, I found out that there was a guy named Choi Jae-young who became rich after moving to Russia during the World War II. As I followed the trace of the rich, I discovered that Choi was a financial and resource supporter of Ahn Jung-geun’s independence movement. Then, I decided to learn about his life since his trace was very similar to that of Choi’s.” Lee also mentioned that he wrote the book with traveling journal and factional story because he wanted to deliver what he felt in his travel. “I wanted to deliver my feelings and thoughts I had while I was traveling. It was very impressive to be at the historical places. I would like readers, especially university students and those who are in their twenties, to learn correct history and to create their own historical views after reading the story of Ahn Jung-geun. He was a brave man who lived his life passionately and who devoted his life for the nation with his eternal belief with his will. This book will serve as a guide for the younger generation to develop patriotism and straight historical view,” he commented. Ahn Jung-geun made his last words saying he wanted to be sleeping in his native country, Korea. However, his body was buried crumpled in a small-sized coffin, and his remains are still not found. Koreans now bring more of their attentions to Ahn Jung-geun to have commemorative year of 2009. Commemorative events are ongoing here and abroad to re-evaluate Ahn’s achievements and spirit as one the nation’s far-reaching independence fighters. The book Immortal Memory of Ahn Jung-geun will provide readers opportunities to think more deeply about the history people usually forget about in their daily lives, as Korea commemorates 100th anniversary of Ahn’s assassination of Hirobumi Ito. We can point to Ahn as a Korean who, without regarding any advancement of his own, devoted his life in hopes of making peace in not only for his own country, Korea, but for World as a whole.